Games can be many different things. Action-focused exercises in speed and combat are everywhere, as are darkly atmospheric nightmares from which players are tasked with escaping. Some ask you to find a way to avoid starvation, others throw you into otherworldly places where the laws of physics hold no sway, and still others require you to manage complex chains of resources to stabilize or exploit virtual economies. Yet there are a few, like ABZÛ, which want nothing more than for you to witness (and perhaps be a leisurely participant in) the experience that will unfold before you. 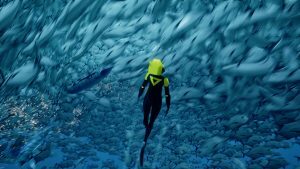 From a team led by Matt Nava, former art director of Journey and now the creative director and co-founder of Giant Squid Studios, ABZÛ is a game built around exploring the ocean. 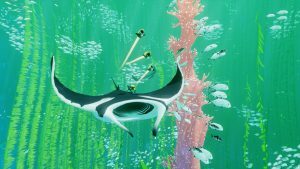 While comparisons to Journey abound in the press (and are apropos), ABZÛ is more than just “Journey but underwater,” and it deserves to be judged without undue comparison. 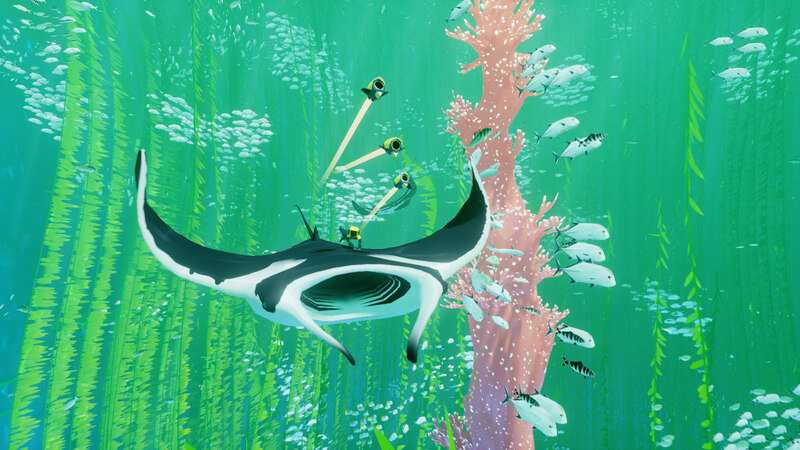 In the same vein as Journey and Flower before it, ABZÛ is indeed less a game and more an interactive adventure, but it’s well worth playing for the experience it provides. 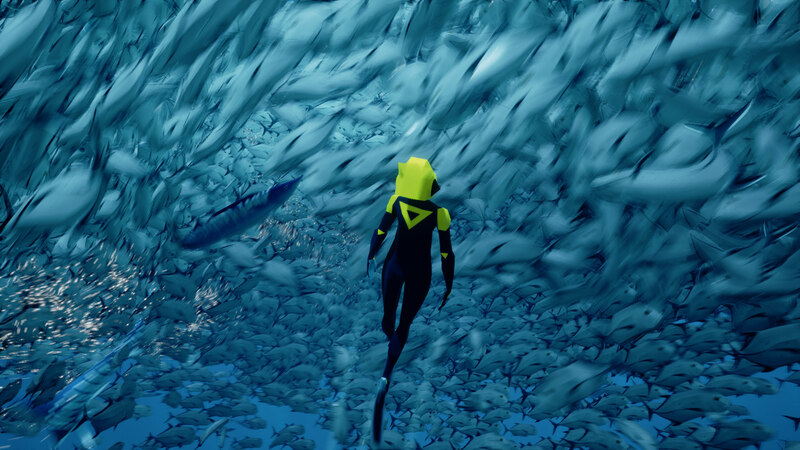 ABZÛ begins simply and serenely, with the nameless player character floating in a tranquil pocket of the sea. Who they are and what they’re doing there are not immediately apparent, and without any answers or special direction, the only thing to do is explore. Controls are reasonably simple, allowing the diver to propel herself forward and change direction at will to either dive more deeply or rise to the surface. Yet the game puts no pressure on her to breathe, leaving her free to explore the world below to her heart’s content, and this lack of pressure extends to the game as a whole. It’s gentle enough that even people who fear deep water may be able to play it without considerable anxiety. No time or health limits are imposed upon the player, nor even any objectives. There is no text, there is no map, and there are no aggressive creatures, only the player and the world. 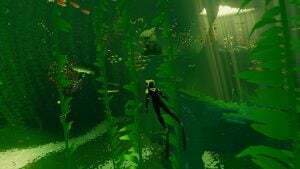 A handful of hidden items are scattered throughout ABZÛ’s undersea kingdom, and there are a few simple puzzles that gate progress from one area to another, but that’s more or less where the game elements stop. On top of that, the whole thing only lasts a few hours. I lingered long and hunted for collectibles, and found myself watching the credits at just over the 4-hour mark. But don’t write ABZÛ off as a thin experience. While it would be easy to condemn it for its lightness, this would be a misguided judgment, as whatever the game lacks in mechanics it overwhelmingly makes up for in presence. 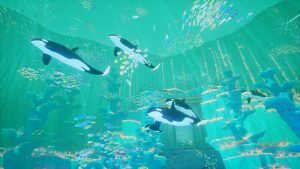 ABZÛ’s environments are a true joy to explore. Not only is the swimming satisfyingly fluid, but every corner of the world is saturated with its own energy. This is sometimes negative energy, offering shadowy canyon floors and dark caves that seemingly weigh down on one’s shoulders, but more commonly it’s positive, bursting with life and color. Beautiful displays of kelp sway lazily with the currents, bending to let the diver pass, while other flora may retract as she approaches. A surprisingly huge cast of real-world sea creatures also populates the game’s mysterious ocean, and they’ve been modeled and animated with obvious care. Sharks, dolphins, whales, and squids whirl through schools of fish of every shape and size, and here and there a cloud of nautiluses or jellyfish may wait idly for the inquisitive diver to come play. The quality of their animation is rivaled by the scale of their numbers (which can be reduced on the PC version if your system needs a little help), and they all possess varying levels of intelligence, allowing them to traverse the environments believably while swimming with or evading the player, or hunting smaller fish for food. Each area contains statues the player can use to meditate, allowing them to simply sit and watch the fish go about their business of living. The spell ABZÛ works so hard to cast is occasionally broken, however, when the camera clips into a larger object, reminding us, if only for a moment, that the world we’ve entered is not real. Certain areas also feel slightly too “clean” in spite of detailed particle effects that make the water weighty and voluminous, and these few instances lack a certain visual interference to trick our brains into believing we’re underwater. But these problems are entirely minuscule in the face of the game’s strengths, and do little to detract from the intensity and grandeur of the overall experience. Despite the fact that the game has no text or dialogue—perhaps unsurprising since the diver’s only co-stars are incapable of speech—there is no lack of aural complexity. The ocean sounds appropriately vast and filled with life, further enhancing the believability of its throng of creatures, and Journey composer Austin Wintory returns to deliver one of the most original and impactful soundtracks in recent memory. It is, simply put, one of the best-implemented and most complimentary soundtracks I’ve heard in nearly 30 years of studying and appreciating video games, in addition to being brilliantly composed and performed. It perfectly captures both the game’s atmosphere and the emotional energy of the story it seeks to tell. While ABZÛ certainly can’t be accused of verbosity, it does indeed have a story, and this simple and touching tale is revealed to players as they push further into the increasingly mysterious environments. There is more to discover than just natural sea life and rock formations, and the diver is eventually given at least a few answers about who she is and what brought the ocean to the state she finds it in. Without spoiling anything, I can say that even if the story isn’t the most original, its themes will resonate with most, and its emotional pull is real. I am personally predisposed to agree with its message, and am likely also susceptible to elements of its delivery in a way that not everyone will be, yet it moved me deeply in unexpected ways. While the conflict (in a less active, more figurative sense of the word) certainly held my attention, and there were moments meant to cause a negative reaction which worked as intended, it was the highs that made me cry for the last 20 minutes of the game. There is a message here, but it’s ultimately not a severe one. This is healing art, something to fill the human spirit with not only hope, but joy, and the graceful manner in which it told the final moments of its story left me breathless. There are subtleties some will miss, and some which I don’t want to spoil. There are even temporal considerations (as vague a statement as that is) which contribute to the creatures one meets and the emotional momentum of the story, assuming the player is observant enough to notice. Suffice it to say that ABZÛ works on many levels to create the whole of its experience, and while it may be short, and it may not be enough of a “game” for some, those with the desire to experience something beautiful will find a grand and affecting adventure. I can’t think of finishing any other work—be it game, film, or book—and wanting so immediately and so intensely to thank the people who created it. In the end, I suppose that says it all. 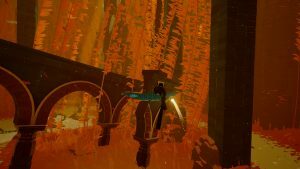 I can offer ABZÛ no higher praise. This is a game that deserves to be played, and it is with a humble and thankful heart that I ask everyone to do so. Even if you aren’t a better person for it—and who knows, perhaps you might be—your life will be richer for the experience. Michael J. Riser is the Indies Editor of GoombaStomp.com, and he also writes weird fiction and articles about videogames. He occasionally posts stuff at Bookruptcy.com, and (more frequently) @Quemaqua on Twitter.